Founded in 1982, Teresa Coleman Fine Arts specialises in fine antique Chinese embroidered costumes and textiles. 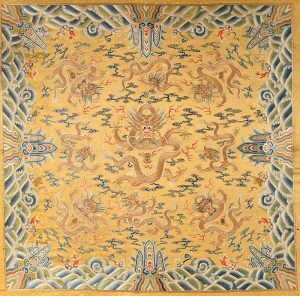 Teresa Coleman is regarded as one of the world’s foremost experts on the magnificent formal dragon robes worn by the Emperor, princes and Imperial ministers, mostly dating from the Qing Dynasty (1644-1911). The gallery also presents formidable wall hangings and unusual and delicately embroidered accessories such as ear muffs, shoes, collars, hats and purses. Exquisitely carved and painted fans, lacquered boxes, paintings and engravings complete the collection.